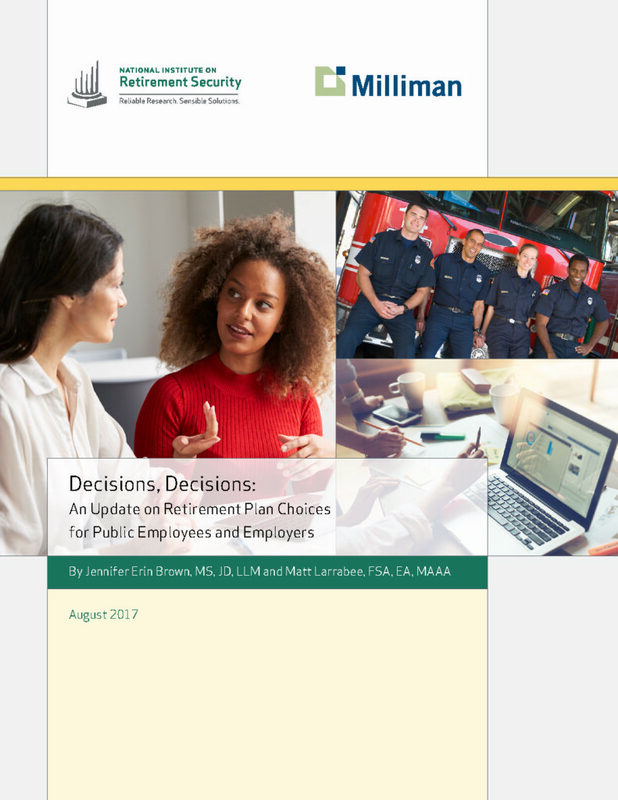 Decisions, Decisions: An Update on Retirement Plan Choices for Public Employees and Employers, finds that public sector employees with retirement plan choice overwhelming choose defined benefit (DB) pension plans over 401(k)-type defined contribution (DC) individual accounts. Among the eight states studied that offer employees such a choice, the DB pension take-up rates in 2015 were 80 percent or higher in six states. Two of the plans studied had pension take-up rates higher than 95 percent, while Florida and Michigan had take-up rates of 76 percent and 75 percent, respectively. Importantly, the research finds that even when the retirement plan default option favors a DC plan, most employees still select a DB pension plan. For example, in Washington the default retirement plan is a combination DB/DC plan. Employees must affirmatively act to elect to participate in the DB pension plan instead, and they do. The majority of newly-hired employees – six out of every ten new hires – actively choose a pension plan. The research is co-authored by Jennifer Brown, manager of research for the National Institute on Retirement Security (NIRS) and Matt Larrabee, principal and consulting actuary with Milliman.